I thought I would start translating this essay, bit by bit. It might be therapeutic for more than just me. It seems more appropriate to post it here than in the General Talk thread about the fire, especially since I'm still fussing with it. I'm not providing a literal prose crib, since it's already prose that I'm trying to stick to as closely as possible, except when the unorthodox word order for emphasis just seems too bizarre in English. Translation quibbles welcome. From his essay Las piedras de Nôtre Dame (The Stones of Notre Dame), published in 1924. The cathedral has the irreparable coldness of the old, which fragments it into innumerable fleurons. Into the scrofulous stones, new stones are melting, the final coloration equivalent to those melodies of hue that are made by letting grains of aniline dye fall into a glass of water. Whether the stones are yesterday's or from this morning, like the rain in Eduardo Villaseñor’s poem; tanned by innumerable suns or blackened where wintry pins have affixed smoke and dust; scratched with the signatures by which the graffiti-scrawls of thirty countries have anchored themselves to eternity; all are from eight hundred years ago. They have adopted one same color palette and, with it, one same spirit. What does it matter if Viollet-le-Duc in his restorations has made prestidigitator's tricks, if we don't see them? Without them the hill of carved stone would have dissolved already in the nitrous air of Paris. Paragraph 1, Sentence 1 was: "The cathedral has the irreparable coldness of old men, which curls it into innumerable fleurons." As I got farther into this essay, I kept finding more typos. For example, in the third section, the second occurrence of "cerbero," "Cerberus," was misspelled "cerebro," "brain." So I'm now convinced that "riza" in the original ("(it) curls or crimps") is actually a typo for the verb "triza," which means "(it) fragments, cracks, or breaks." The noun "triza" means...wait for it..."shard." LOL! Also I think that the impersonal translation the old is a better than "old men" in this context. Paragraph 1, Sentence 2, had: the final hue equivalent to those melodies of color. The changes seem a bit clearer in English, even if they are a bit of a departure from cognates. La catedral tiene el frío irreparable de los viejos, que la riza en innúmeros florones. Con las piedras escrofulosas se funden piedras nuevas, igual que un matiz final esas melodías de color que se hacen dejando caer granos de anilina en un vaso de agua. Sean de ayer o de esta mañana, cual la lluvia en el verso de Eduardo Villaseñor, doradas por innúmeros soles o negruzcas donde los alfileres invernales prendieron humo y polvo, arañadas por las firmas con que se asen a la inmortalidad los minúsculos de treinta países, todas son de hace ochocientos años; han tomado un mismo tono y, con él, un mismo espíritu. ¿Qué importa que Viollet-le-Duc en sus restauraciones haya hecho trampas de prestidigitador, si no las vemos? Sin ellas la colina de piedra tallada se habría disuelto ya en el nitrosos aire de París. From the hallucinatory tortuousness of the stairway—as many steps as days in the year: doesn’t it take a year to climb?—one exits abruptly into sun-blindness. The wind is lecturing, but it is not in good taste to listen to a tour guide. We have come because the natural yearning of mankind is to tower; in order to see, or better still, in order to have risen. The cathedral tolerates us as we will tolerate a fly that beats its celluloid wings while perched on a fold of clothing: it does not perceive us. Isn’t it under the intoxicating influence of the height, the light, and the silence that underlines a chirping of unseen birds, the voice of this blue and of this gold which have burnished the centuries? All around, Paris forms the horizon. De la tortura alucinante de la escalera -tantos escalones como días en el año: ¿no se tarda un año en subir?...- se sale bruscamente al deslumbramiento solar. El viento pronuncia discursos, pero no es de buen gusto prestar atención a un cicerone. Hemos venido porque el anhelo natural del hombre es dominar; para ver, mejor aún, para haber subido. La catedral nos soporta como nosotros soportaríamos a la mosca que pule sus alas de celuloide encaramada en un pliegue de la ropa: no nos siente. ¿No tiene la embriaguez de la altura, de la luz y del silencio que subraya a un piar de pájaros invisibles, voz de este azul y de este oro que bruñeron los siglos? Last edited by Julie Steiner; 04-16-2019 at 01:56 PM. Atop the balustrade of the narrow gallery down which Quasimodo ran, the chimeras make perceptible the monsters of a nightmare. From our eyes to them runs a line of suspended dots, and over our heads pops a little balloon with a question mark inside, the same as in the Mutt and Jeff comics. The harpies with bulbous digits and the cloak of a devotee; the elephant, acrobatic but modest; the pelican anchored by its beak; the Dog Cerberus, grandfather of all concierges; and a thousand devils, hobgoblins, vampires and stryges. One demon with a human torso and a beastly head devours a kid goat with the same ravenousness as gluttons devour barbeque at cookouts; another, with immense ears and imposing belly, shows his plutocratic greed over the proletarian rooftops. In a melancholy way, we smile: we have behind us a thousand philosophy books, telescopes, laboratories, a powerful and insolent locomotive; and now—alas!—now we are not afraid of devils. The gargoyles bristle the cathedral just as spines bristle the purple stem of the blackberry: griffins, hags, dragons, and grotesque characters, without breasts, in order that they might resist vertigo. More so than in the chimeras, in them was deployed the satirical vein of the town, channeling the stone to jocular vomiting. As one such example, in the old palace of the abbots of Cluny, one friar… But it is indescribable, the cynical figure from the 15th century that, at four meters above the sidewalk, releases murky liquids on rainy days. Note: “Fecit” in the last sentence is Latin for “(he/she) made." This word used to accompany an artist’s signature. Paragraph 1, Sentence 1: make perceptible was "sensitize one to," then simply "sensitize." I'm still unsure of this. Also, monsters was "horrors," but the context of a later chunk of the essay now makes it clear to me that this is what the author really means when he uses this word. Paragraph 3, Sentence 3: squirm was "bustle." Bullir literally means "boil," and is often applied to things like crowds, and like Daphne's moving legs in the Garcilaso sonnet I butchered here some months ago. I think "squirm" is much better than "bustle" in this context. Las gárgolas erizan la catedral como las espinas el tallo cárdeno de la zarza: grifos, tarascas, dragones y personajes grotescos, sin senos, para que resistan al vértigo. Más que en las quimeras, en ellas se desplegó la vena satírica del pueblo, acanalando la piedra para jocundos vómitos. Tal por ejemplo, en el antiguo palacio de los abades de Cluny, un fraile... Pero no es descriptible el cínico muñeco del siglo XV que, a cuatro metros sobre la banqueta, exonera en los días de lluvia líquidos turbios. That's the first half of the essay. I'll wait a few days before posting the three remaining chunks. I'll try to find one of the demon eating a goat. They existed, these monsters, given that people believed in them. And here they are, petrified like the dinosaurs that disappeared thousands of aeons ago. The primitive Indians of America clothed their gods in death’s-heads, interlaced serpent bodies, menacing claws and teeth, to be able to fear them, as they feared death, beastly claws and teeth, serpents. Their devotion had to be nourished with terror. That impulse is also the one of the Middle Age: fear was its grand voluptuousness. Drunk on the supernatural, it lived in fear of the demon, and by force of thinking about it, saw it everywhere, and everywhere depicted it; to materialize it was perhaps to vanquish it. And with that intellectual cruelty that does not belong to anyone more than to France—says Chesterton—it intermixed with blasphemies the supplication of its churches. “The people of the Middle Ages,” notes one critic, “believed that the visible was only a representation and promissory note for the portion of the invisible that it covers again with a veil, opaque for the common people and transparent to the eyes of the learned.” That symbolism traced the characters of a hermetic language in the ogival Romanesque stones. We can spell out some sentences, but we do not yet understand their sense; in the “twelve monsters of the zodiac” we see the plain symbol become apparent, not its why; poisoned by orchids, we no longer perceive the thousand-year-old perfume of the three roses of Beauty; and the dove of Prudence cannot compete with our airplanes, nor the arrows of Swiftness with our automobiles. Existieron esos monstruos, puesto que los hombres creyeron en ellos. Y aquí están, petrificados como los saurios desaparecidos desde miles de evos. Los indios primitivos de América ponían a sus dioses cabezas de muerto, cuerpos de serpiente entrelazadas, zarpas y dientes amenazadores, para poder temerles, como temían a la muerte, a las zarpas y los dientes bestiales, a las serpientes. Su devoción tenía que nutrirse de terror. Ese impulso es también el de la Edad Media: el miedo fue su gran voluptuosidad. Ebria de sobrenatural, vivía en el temor al demonio, y a fuerza de pensar en él lo veía en todas partes, y en todas partes lo pintaba; materializarlo era quizás derrotarlo. Y con esa brutalidad intelectual que no pertenece más que a Francia -dice Chesterton- entremezcló de blasfemias la plegaria de sus catedrales. 'Los hombres del Medievo -anota un crítico- creían que lo visible es un signo y vale solamente por la porción de invisible que recubre de un velo, espeso para el vulgo y transparente a los ojos de los doctos'. Ese simbolismo trazó los caracteres de una lengua hermética en las piedras románicas y ojivales. Podemos deletrear algunas frases pero no entendemos ya su sentido; en 'los doce horrores zodiacales' vemos el claro símbolo aparente, no su porqué; envenenados de orquídeas ya no percibimos el milenario perfume de las tres rosas de la Belleza; y la paloma de la Prudencia no puede competir con nuestros aeroplanos ni las flechas de la Velocidad con nuestros automóviles. Last edited by Julie Steiner; Yesterday at 02:10 AM. Prayer in Notre Dame has the stuffy frailty of a courtesy call; the worship seems to limit itself to a compendium of empty formulas like an official ceremony. 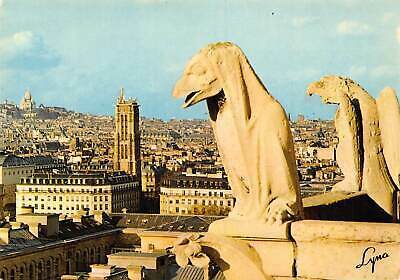 Gargoyles and chimeras squash the cathedral and darken it: they will never go away, the demons, sentinels in the strategic bastions of the façade. That is why the Sacré-Coeur, where all the capitalist insolence of the “stupid 19th Century” coagulates, is the true cathedral of Paris. In its opulent and comfortable ambiance the Church feels free of the obsessive presence of the Damned, with the optimistic security that gold coins must experience in the armored box of a bank. 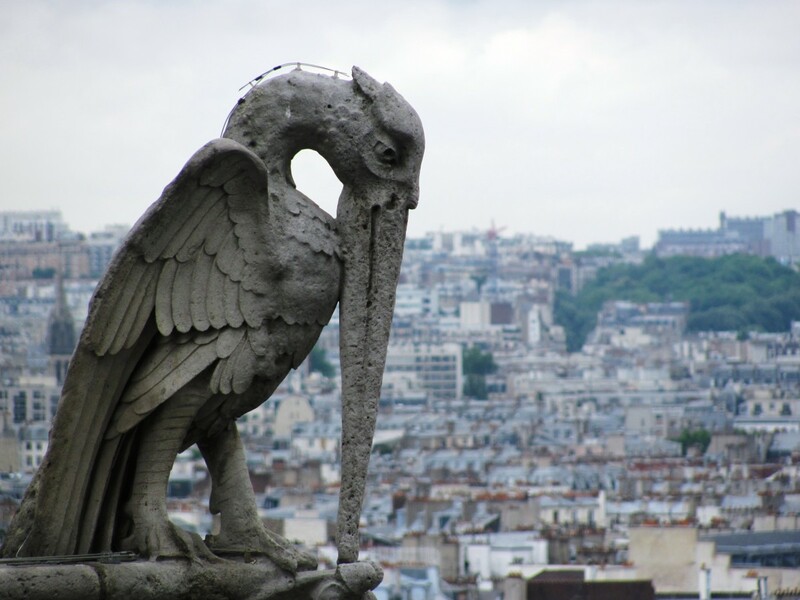 The Basilica is not founded on the pilings that pin the soft earth of Montmartre, but rather on this unspeakable necessity: to make another cathedral, because Notre Dame, profaned by who knows what spirits of ice, is incapable of being animated ever again with the aroma of faith. La oración en Nôtre-Dame tiene la frialdad estirada de una visita de cumplido; el culto parece limitarse a un compendio de fórmulas vacías como una ceremonia oficial. Gárgolas y quimeras aplastan a la catedral y la entenebrecen: no se irán nunca los demonios, centinelas en los baluartes estratégicos de la fachada. Por eso el Sacré-Coeur, donde se cuaja suntuosamente toda la insolencia capitalista del 'estúpido siglo XIX', es la verdadera catedral de París. En su ambiente opulento y confortable la Iglesia se siente libre de la obsedante presencia del Maldito, con la seguridad optimista que deben experimentar las monedas de oro en la caja blindada de un Banco. No se cimienta la Basílica en los pilotes que alfilerean la tierra blanda de Montmartre, sino en esa necesidad inconfesable: hacer otra catedral, porque Nôtre-Dame, profanada por quién sabe qué espíritus de hielo, es incapaz de animarse nunca más con el aroma de la fe. The slender, predacious fingers support the snub-nosed head: the devil looks far away and sticks out his tongue at the statue of Charlemagne and at the Sorbonne—at Power and at Science. Being himself one who can do all, and who knows all. 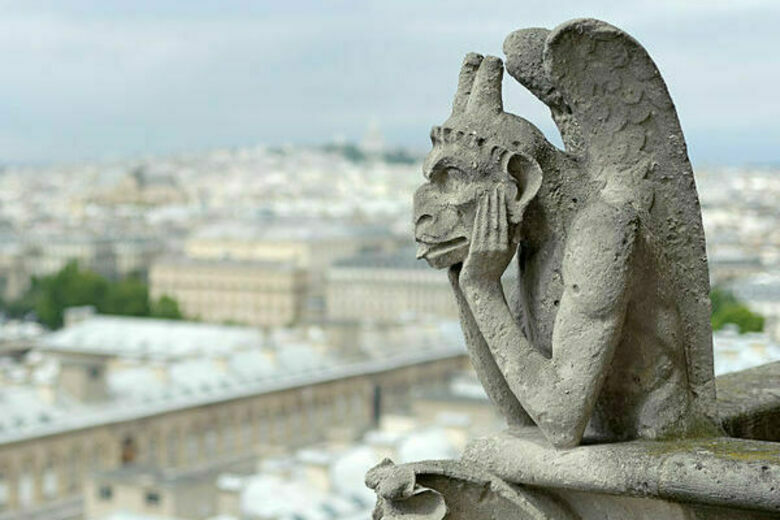 The humorists say that his lingual gesture from above Paris is pointed at exactly that: Paris. But his eyes are full of mystery. We cannot laugh at his ugliness, because he thinks—which is to say, he is humanized: the devil is something that shall be overcome—oh, Nietzsche! And if God created man in his image and likeness, man, in his own image and likeness, created the devil. Except that, by making him think, he has redeemed him. Legend tells that the gaze of the Thinker indicated the place where a treasure used to be hidden, which was found by the clever or malicious alchemist Nicholas Flamel. We believe in legends and end up gaining a little hope. Sardonic witness of Paris for eight centuries, today he sees the river domesticated, a pleasant excuse for the watercolors of connoisseurs; trolleys, automobiles, disdainful airplanes, born to be man's wings: those of the devil are useless now. Paragraph 1, Sentence 1: far away was "at something distant"--but an idiom should be translated in a similarly idiomatic and pedestrian register, I think. Paragraph 1, Sentence 5: shall be overcome was "must overcome itself," but treating the pronoun "se" as reflexive rather than passive didn't seem to make sense in the context of Nietzsche. Los dedos finos y ganchudos sostienen la chata cabeza: el diablo mira a lo lejos y saca la lengua en burla a la estatua de Carlomagno y a la Soborna, al Poder y a la Ciencia. Él, que todo lo puede y que todo lo sabe. Los humoristas dicen que su gesto lingual sobre París significa eso: París. Pero están llenos sus ojos de arcano. No podemos reír de su fealdad, porque piensa, es decir, se humaniza: el diablo es algo que debe superarse ¡oh Nietzsche! Y si Dios creó al hombre a su imagen y semejanza, el hombre, a imagen y semejanza propia, creó al diablo. Sólo que, haciéndole pensar, lo ha redimido. La leyenda cuenta que la mirada del Pensador señalaba el lugar donde se escondía un tesoro que descubrió, hábil o malicioso, el hermetista Nicolás Flamel; creamos en las leyendas y saldremos ganando un poco de esperanza. Burlón testigo de París durante ocho siglos, ve hoy el río domesticado, amable pretexto para acuarelas de aficionados, los tranvías, los automóviles, los aeroplanos desdeñosos: al hombre le han nacido alas: las del diablo son ya inútiles. A peculiar chill of horror, a mysterious sense of awe forbids us to write any further today. Our breast is full of a dreadful pity—old Jehovah himself is preparing for death. We have known him so well, from his cradle onwards, back in Egypt where he was brought up amongst divine calves, crocodiles, sacred onions, ibises, and cats. We have seen him as he bade farewell to these playthings of his childhood and the obelisks and sphinxes of his native Nile valley, became a little god-king in Palestine, with a poor nation of shepherds, and settled down in his own temple-palace. We saw him later on, when he came into contact with Assyrian-Babylonian civilization, and laid aside his all-too-human passions, no longer just spewing out rage and revenge, or at least no longer instantly hurling thunderbolts down at every bit of despicable behavior. We saw him emigrate to Rome, the imperial city, where he renounced all national prejudices and proclaimed the heavenly equality of all peoples, and with the use of such smooth phrases formed the opposition party against old Jupiter, and intrigued for so long until he took complete control, and from atop the Capitol ruled the city and the world, urbem et orbem. We saw how he became more and more spiritualized, how softly and blissfully he whimpered, how be became an amiable Father, a generic Friend to Man, a Contributor to World Happiness, a Philanthropist—but none of it could save him. Can’t you hear those little bells tinkling? Down on your knees! They’re bringing the sacraments to a dying God. Happy Easter to you, Julie -- I say that with no irony.